During a market consolidation as we are facing now, it is important to re-evaluate trading strategies and re-analyze the stocks currently in a basket. Such correction as happened recently in February makes investors rebalance their portfolio. This results in dumping weak stocks and holding or even buying more of the strong ones. Once market consolidates, these strong stocks tend to surge the most – even outperforming the industry. One of them is Barret Business Services (NASDAQ: BBSI). The company provides business management and human resources services such as payrolls, employee benefits, recruiting, administration, etc… It serves electronics manufacturers, various light-manufacturing industries, agriculture-based companies, transportation and shipping enterprises, food processors, telecommunications companies, and professional services firms. The last two reported earnings have beaten the estimates. The revenue has been significantly rising on annual basis. All of the above are incredibly strong ratios that support powerful foundations for continuous trend. Barret Business Services has been in the bull market for a long time ago. In a recent year, the price developed a bull channel (orange lines). 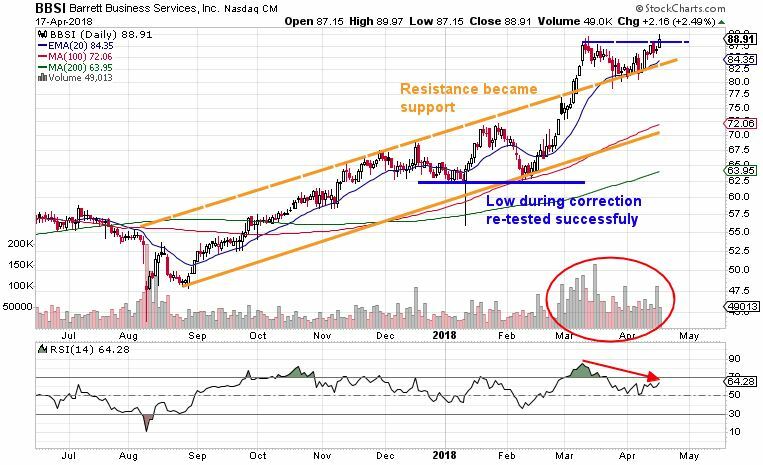 During the February market correction, the company successfully tested its previous lows (blue line), while bouncing up from the 100 SMA, which is a strong confirmation of an entire trend. Most recently the price broke through the resistance level (orange dashed line) at the beginning of March and successfully retested its new support in April. The last month has been accompanied by increased trading volume (red circle) that is a favorable sign of investors’ interest in the company’s shares ownership. At the moment the price is jumping to new highs (blue dashed line). Staying above this level for few days will represent a great entry point. Important: There is an RSI and MACD bearish divergence (red arrow lines), which means that the stock is likely to reverse again back to the support – orange dashed line / 20 EMA. Once divergence is eliminated, the stock price is poised to fly. Barret Business Services Inc. signifies a great opportunity for both long-term and short-term investors. The stock applies well to trend following strategy when its price might be driven to significantly higher levels.